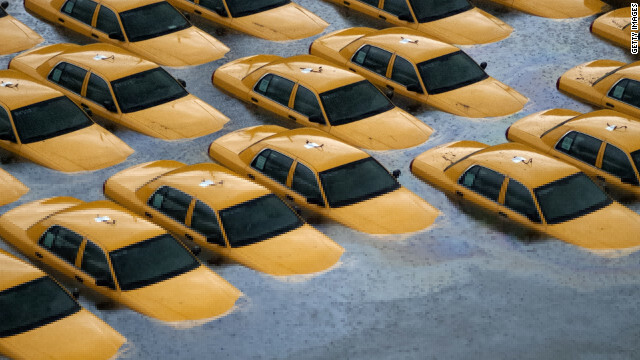 Taxis sit in a flooded lot in Hoboken, New Jersey, on Tuesday. Editor's Note: Superstorm Sandy smashed ashore last night, triggering floods, fires and devastation. At least 33 people are known to have died in the United States and one in Canada, adding to the storm’s earlier toll of 67. Millions are without power. Floods have hit homes and the New York subway system. Here is the full story and below is the latest news as we learn it. Are you there? Send your stories and photos to CNN iReport but stay safe. [Update 11:02 p.m.] Superstorm Sandy continues to weaken over Pennsylvania. It is some 50 miles east-northeast of Pittsburgh, according to an 11 p.m. advisory from the National Hurricane Center. The storm is expected to move northward into Canada on Wednesday. [Update 10:57 p.m.] About 6.6 million customers are without power in 15 states and the District of Columbia, according to figures compiled by CNN from power companies. That's about 300,000 less than the tally roughly 2 1/2 hours ago. [Update 10:47 p.m.] Halloween activities at the White House have been canceled because of the storm, according to the official schedule. [Update 10:29 p.m.] Even residents used to storms were struck by the severity of Superstorm Sandy. “You would not believe the amount of ocean water that has pushed through onto the shore, down blocks. It has downed trees, power poles. 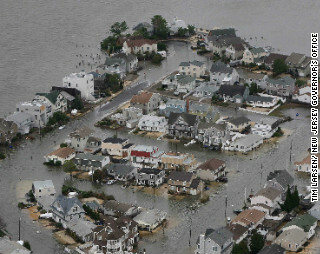 People are just heartbroken here,” said Jon Daniel, who lives two blocks away from the ocean in Deal, New Jersey. [Update 9:41 p.m.] New York public transportation all but ground to halt with the storm. It is slowly coming back. Buses are on the road now for limited service, and the Metropolitan Transportation Authority expects to know more about service restorations tomorrow. [Update 9:19 p.m.] New York’s John F. Kennedy Airport will be open tomorrow, as will Newark Liberty International in New Jersey. However, carriers will be providing limited service at both, according to the Port Authority of New York and New Jersey. 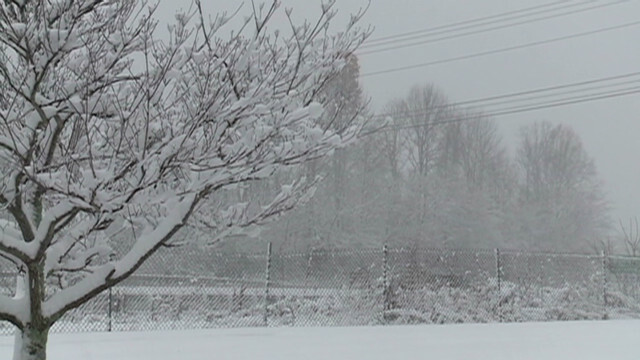 Other area airports, LaGuardia and Teterboro, are expected to remain closed. A bird's-eye view of the flooding. [Update 8:31 p.m.] About 6.9 million customers are without power in 15 states and the District of Columbia, according to figures compiled by CNN from power companies. That's about 1 million less than the tally roughly four hours ago. [Update 8:20 p.m.] Six people have died in storm-related incidents in New Jersey, Gov. Chris Christie told reporters Tuesday night. His state's figure raises the overall U.S. death toll from Superstorm Sandy to at least 33. [Update 8:06 p.m.] Hudson River ferry service will restart at 7 a.m. tomorrow from New Jersey to the World Financial Center in New York, giving commuters an alternative way to get into and out of lower Manhattan, the Port Authority of New York and New Jersey says. [Update 7:20 p.m.] An off-duty police officer in New York City was found dead this morning in the basement of his flooded home. As Superstorm Sandy struck, he shepherded his family into the attic, according to city police. He then went to the basement, and never returned. Emergency personnel responded to the house last night but were unable to enter it because of downed power lines in the water. The off-duty officer, Artur Kasprzak, 28, was a seven-year veteran of the department. Bloomberg said he took an aerial tour of the city today, to survey the areas hardest hit. Public schools will remain closed tomorrow, but his understanding - at this point - is that Sunday’s New York City marathon will happen as planned. "We have a plan for recovery, and that recovery is already beginning," Bloomberg said. "I’m happy to say it’s the beginning of a process that we all know will take a while, but this is the end of the downside and hopefully from here is going up." About 6,400 people remain at the city's 76 evacuation centers, he said. "Restoring power and mass transit remain the two biggest challenges in the days ahead," Bloomberg said. "That recovery is a mammoth job." [Update 6:13 p.m.] Eighteen people in New York City have died as a result of the storm, Mayor Michael Bloomberg tells reporters. At CNN's last count, 15 had been reported dead in all of New York state. We'll have more details about the death toll later. [Update 6:04 p.m.] “All things considered,” Atlantic City, New Jersey, “did pretty good,” Mayor Lorenzo Langford told CNN. All the major roadways into the city remain closed, Langford said, and some 13,000 customers are still without power. [Update 5:42 p.m.] Sandy and its aftermath continue to wreak havoc on air travel. At Chicago O’Hare International Airport, airlines have canceled close to 500 flights to and from the East Coast. Locally, some local flights are experiencing delays because of strong winds. [Update 5:31 p.m.] Keith Paul, owner of a restaurant in Toms River, New Jersey, says he escaped nearby Seaside Heights - on a barrier island across a bay from Toms River - just minutes before the storm disabled a bridge on Monday afternoon. Paul was one of the last people to leave the island, which was under an evacuation order, before the storm hit. Police and rescue teams have been working to evacuate about 200 people who are stranded on New Jersey's barrier islands, including the one containing Seaside Heights. "Within two minutes of leaving, light poles came across the bridge, so if we didn’t leave when we did, we would have been stuck there," Paul told CNN's Wolf Blitzer on Wednesday. Water washed over Seaside Heights and other barrier island locations, tearing apart some structures and leaving sand and debris all over the area (see the National Guard's video of the area, above). Paul said he say Seaside Heights' Berkeley Sweet Shop get torn apart in the storm. He says that, according to pictures he's seen and information from friends, that half of the rids at FunTown Amusement Pier in nearby Seaside Park "are in the ocean." Toms River, on the mainland, also is a mess, Paul said. His restaurant will be closed for days, he said, and some people in that city need rescuing from homes surrounded by floodwater. [Update 4:56 p.m.] One of the 60 people stranded on Fire Island, New York, says she and her husband are doing OK in their home and doesn't regret riding out the storm there. Karen Boss and other Fire Island residents disregarded a pre-storm evacuation order and now are, for the moment, stuck there with contaminated water and no electric service. She told CNN by phone that a generator is powering her house now. There is floodwater under her house, but the interior is not flooded, she said. "The winds were wild," she said of the storm. "My house was rocking. ... We did head up toward the ocean - the waves were extremely, extremely high. When the high tide came into the bay ... water gushed over the boardwalk." Rescuers had helped 14 people off the island - south of Long Island - by Tuesday morning, said Vanessa Baird-Streeter, director of communications for Suffolk County. [Update 4:23 p.m.] About 7.915 million customers are without power in 15 states and the District of Columbia, according to figures compiled by CNN from power companies. That's about 68,000 lower than the tally about two hours ago. [Update 4:18 p.m.] Federal agencies in Washington will be open tomorrow. They were closed Monday and Tuesday because of the storm. [Update 3:59 p.m.] The U.S. death toll from Superstorm Sandy has risen to 30, with a death just reported in North Carolina. The toll includes 15 in New York; three in New Jersey; three in Pennsylvania; two in Maryland; two in Connecticut; two in Virginia, one in West Virginia, one in North Carolina, and one on the HMS Bounty. One person was killed in Canada, and 67 were killed in the Caribbean, including 51 in Haiti. The overall death toll stands at 98. [Update 3:26 p.m.] Police and rescue teams have assisted evacuating about 200 people stranded on New Jersey's barrier islands, CNN's Michael Holmes and Roger Clark report from outside Toms River, just west of the islands. People on the islands had been ordered to evacuate ahead of the storm, but many stayed. Though many people need rescuing, no deaths on the islands have been reported. Emergency evacuations for the day have been suspended, however, because of the coming darkness. [Update 3:12 p.m.] JetBlue Airways has posted a few flooding pictures from New York's LaGuardia Airport, which is closed because of the storm. LaGuardia is not expected to open Wednesday either because of extensive damage, New York Gov. Andrew Cuomo said during a news conference this morning. New York's JFK International Airport probably will be reopened tomorrow, he said. [Update 3:04 p.m.] President Barack Obama said he wants no excuses from anyone in the federal government when it comes to providing resources to those who need it because of the storm. "My message to the federal government: no bureaucracy, no red tape, get resources where they’re needed as fast as possible, as hard as possible, and for the duration," Obama said at the Red Cross headquarters in Washington. He added: "My message to the governors and the mayors, and through them to the communities that were hit so hard, is that we'll do everything we can to get resources to you and (get) any unmet need identified." Obama also warned that the storm is still moving north, and encouraged Americans to stay alert. The White House has said Obama will travel to New Jersey on Wednesday "where he will join Gov. Christie in viewing the storm damage, talking with citizens who are recovering from the storm and thanking first responders who put their lives at risk to protect their communities." [Update 2:55 p.m.] U.S. Rep. Bob Turner, R-New York, is one of people who lost a home in a massive fire that happened during the storm early Tuesday in the Breezy Point neighborhood of Queens, New York. More than 80 homes were destroyed in the blaze. "I, along with many other Breezy Point residents, lost our homes last night and I am grateful that my family and I are safe after this destructive storm," Turner said in a statement released Tuesday. "I hope you will join me in lending a hand to those who were less fortunate and keep everyone impacted by this storm in your thoughts and prayers." Turner said his "thoughts and prayers are with all of my fellow New Yorkers and the many others who are experiencing loss as a result of Hurricane Sandy." "Last night's storm showed once again that the professionalism and bravery of our first responders is second to none. I want to commend the men and women who put their lives on the line everyday in order to keep others safe," he said. Turner was elected last year in a special election to replace former U.S. Rep. Anthony Weiner. [Update 2:43 p.m.] Though the remnants of Sandy are now centered over western Pennsylvania, the large storm still will affect the East Coast this afternoon, and during high tide some more coastal flooding - in the range of 2 to 4 feet - is possible, said the National Hurricane Center's director, Rick Knabb. Some minor shoreline flooding also could happen at the Great Lakes, Knabb said. The storm's center is expected to be north of the Great Lakes, in Canada, on Wednesday, he said. A couple of hours ago, the storm's maximum sustained winds were at 45 mph. "I don't want people to (think) that the weather event is anywhere near over," Knabb said. [Update 2:31 p.m.] About 8 million customers are without power in 15 states and the District of Columbia, according to numbers compiled by CNN from local power providers. Our previous count, around 10 a.m., was about 7.5 million customers. [Update 1:56 p.m.] Restoration of power to all customers in areas served by overhead power lines could take at least a week; restoring underground lines will take four days, according to Con Edison, which provides power in most of New York City and Westchester County, New York. 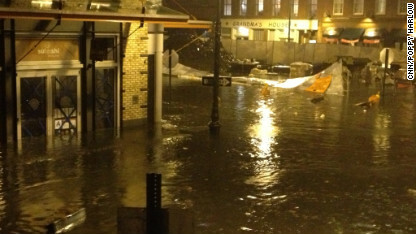 [Update 1:49 p.m.] Half of Hoboken, New Jersey, is flooded, Mayor Dawn Zimmer told CNN. "The Hudson River came in and filled half of Hoboken like a bathtub," she said. Pump stations are flooded, and much of the city will not be able to get power back until that flooding is gone. There's "major concern" about people walking in the streets, because live wires could be in there, Zimmer said. [Update 1:39 p.m.] CNN has video of a crane's partial collapse in New York City today. [Update 1:05 p.m.] The U.S. death toll from Superstorm Sandy has risen to 29, with another death reported in Pennsylvania and two in Virginia. The toll includes 15 in New York; three in New Jersey; three in Pennsylvania; two in Maryland; two in Connecticut; two in Virginia, one in West Virginia, and one on the HMS Bounty. One person was killed in Canada, and 67 were killed in the Caribbean, including 51 in Haiti. The overall death toll stands at 97. He was checking the area for his brother, who lives in the area but isn’t there today. “I walked up, took a few pictures, and I’m going to e-mail them to my brother,” he said. [Update 12:53 p.m.] The New York Stock Exchange says it will reopen Wednesday morning after being closed for two days due to Superstorm Sandy. [Update 12:30 p.m.] About 60 people are stranded on New York's Fire Island with contaminated water and no electricity after they did not obey mandatory evacuation orders over the weekend, officials say. "We were able on Monday morning to rescue about 14 people" from the island, said Vanessa Baird-Streeter, director of communications for Suffolk County. Now, officials are working to make sure those left on the island are safe. The Coast Guard is flying over the area. Long Island Power Authority had "de-energized" the area after the mandatory evacuation, Baird-Streeter said. [Update 12:20 p.m.] New York's Metropolitan Transportation Authority says it will resume limited bus service today at 5 p.m. Fares will be waived for the time being, the MTA said on Twitter. [Update 12:16 p.m. ET] About 300 blood drives across the country had to be canceled because of the superstorm, leaving a shortfall of almost 9,000 units, the Red Cross says. One way to help people: donate blood, the organization tweeted. For other ways to help, visit CNN.com/Impact. [Update 12:07 p.m. ET] Want to help New Yorkers? The mayor's office says this is one way to do it. And Mayor Bloomberg says help may be needed for some time to come. Earlier: 67 in the Caribbean, including 51 in Haiti. [Update 11:58 a.m. ET] Even though the superstorm has moved inland, don't even think of taking a boat out on the water, the U.S. Coast Guard says. [Update 11:56 a.m. ET] The death toll in the United States from Superstorm Sandy in the United States is at 26. [Update 11:54 a.m. ET] "I don’t think words like catastrophic or historic are too strong to explain the impact" of Superstorm Sandy, New York Gov. Andrew Cuomo said today. "The most devastating news is that we lost 15 New Yorkers last night. That is our best estimate at this time. My guess is, if anything, that number is going to get larger. And that is really the worst news of the entire episode." [Update 11:51 a.m. ET] The Chagrin River in northeast Ohio is above flood stage, and boats are being washed into Lake Erie, CNN affiliate WEWS reports. See photos here. [Update 11:44 a.m. ET] Newark, New Jersey's mayor praises residents' response to the storm. [Update 11:42 a.m. ET] President Barack Obama will remain in Washington Wednesday to monitor the response to Sandy and will not participate in campaign events that had been scheduled in Ohio, the White House said Tuesday. [Update 11:41 a.m. ET] Massachusetts Gov. Deval Patrick said there have been no reports of serious injury or infrastructure in his state. "We feel very fortunate," he said Tuesday. [Update 11:39 a.m. ET] New York’s LaGuardia Airport is not expected to open tomorrow because of extensive damage, New York Gov. Andrew Cuomo said during a press conference this morning. JFK airport likely will be re-opened tomorrow, he said. [Update 11:37 a.m. ET] The superstorm is bringing blizzard conditions to West Virginia, where strong winds and thick, heavy snow are bringing down limbs and power lines. Nearly 250,000 people in the state are without power, and 12 of the state’s 55 counties are under a blizzard warning, Gov. Earl Ray Tomblin said Tuesday morning. The storm could drop 2 to 3 feet of snow across the state. Ten inches of snow had fallen in Kingwood, West Virginia, by 10 a.m. ET. Tomblin said people should stay off the roads, but if they must travel, slow speeds are a must. Tomblin said that because officials were warned about the storm days in advance, they were able to position highway crews and National Guard units strategically across the state to start clearing roads so power crews can quickly work to restore power. The power restoration process should be quicker than it was this summer, when a strong storm knocked out power to many Midwestern and Eastern states, including West Virginia, where customers were without power for days in 53 counties. [Update 11:33 a.m. ET] The Sterling Building in downtown Cleveland, Ohio, which houses Cuyahoga County's 911 service, is being evacuated due to safety concerns, CNN affiliate WEWS reports. [Update 11:29 a.m. ET] A protective cover over the space shuttle Enterprise, now part of a museum on the aircraft carrier Intrepid in New York Harbor, collapsed during the storm. Read cnn.com/lightyears. [Update 11:25 a.m. ET] New York City residents can use tap water, Mayor Michael Bloomberg says, although it may taste of more chlorine than usual. [Update 11:22 a.m. ET] At least 21 people have died as a result of Superstorm Sandy in the United States. [Update 11:19 a.m. ET] New York City schools will be closed on Wednesday, Mayor Michael Bloomberg announced in a press conference. The district serves 1.1 million students in 1,700 schools, in New York City. [Update 11:13 a.m. ET] Power may be out different locations in New York for the next two or three days - "or maybe even longer than that," Mayor Michael Bloomberg said Tuesday. [Update 11:10 a.m. ET] U.S. financial markets are expected to reopen Wednesday, after being shuttered for two days to deal with the impact of Hurricane Sandy, CNNMoney reports. Major exchange operators NYSE Euronext and Nasdaq OMX said Tuesday they were preparing to resume operations. The exchanges were spending the bulk of the day conducting tests with member firms to ensure all systems were running smoothly. [Update 11:07 a.m. ET] Sandy may be the worst storm New York has ever experienced, Mayor Michael Bloomberg said Tuesday. He told reporters at least 10 people died in New York City. [Update 11:06 a.m. ET] New York Mayor Michael Bloomberg says it is believed more than 80 houses were destroyed by a fire in Queens. [Update 11:03 a.m. ET] A boat blocks MTA tracks in New York. More images from the MTA are here. [Update 10:43 a.m. ET] The amusement pier at Seaside Park on the Jersey Shore is half washed out, Gov. Chris Christie says, with the roller coaster and the log-plume ride in the ocean. [Update 10:41 a.m. ET] "The level of devastation at the Jersey Shore is unthinkable," New Jersey Gov. Chris Christie says. Read more. [Update 10:32 a.m. ET] New Jersey's governor says residents should not try to return to homes on the barrier islands. [Update 10:26 a.m. ET] Helicopters have been called in to help rescue residents stranded by floodwaters around Berry Creek, a tributary of the Hackensack River, in Bergen County, New Jersey, CNN's Maggie Lake reports. [Update 10:22 a.m. ET] About 7.5 million customers are without power in 15 states and the District of Columbia, according to numbers compiled by CNN from local power providers. [Update 10:19 a.m. ET] A National Weather Service employee in Bowden, West Virginia, reports 24 inches of snow as of 9 a.m.
[Update 10:17 a.m. ET] The New Jersey Turnpike Authority has opened the Garden State Parkway in both directions. Tolls will resume at 2 p.m.
Travel lanes are still blocked by storm damage at 190 locations across the state, including portions of the New Jersey Turnpike. [Update 10:13 a.m. ET] There have been more than 15,000 flight cancellations since Sunday as a result of Sandy, according to flight tracking site FlightAware.com. Read the latest CNN.com report on how Superstorm Sandy has affected travel. [Update 10:03 a.m. ET] Amtrak says in a post on its Facebook page that it is assessing damage to its tracks and will make a decision later today when service will be restored on lines suspended because of Superstorm Sandy. [Update 9:57 a.m. ET] Water was flooding “at a massive rate” into the construction site at New York City’s ground zero, according to an official instagram photo from New York Gov. Andrew Cuomo’s office posted overnight. Pumping operations were to begin when the surge subsided, the photo says. [Update 9:51 a.m. ET] The Huffington Post, Gawker and many other sites were unreachable for a period after Datagram, a New York-based provider of corporate Internet connections and servers, said it was battling flooding in its offices, CNNMoney reports. [Update 9:47 a.m. ET] About 80 homes downstream of Speedwell Forge Lake Dam in Lancaster County, Pennsylvania, were advised to evacuate, CNN affiliate WHTM reports. The dam's spillway was damaged last year by Hurricane Irene and Tropical Storm Lee. Though the lake has been drained, officials worry an increase in water levels from Sandy could cause the dam to fail, the report said. [Update 9:32 a.m. ET] Nearly 11,000 people spent Monday night in 258 Red Cross-operated shelters across 16 states, the American Red Cross tells CNN. [Update 9:26 a.m. ET] The state of West Virginia is asking only its essential state employees to report to work Tuesday, the governor's office said. [Update 9:20 a.m. ET] New York's governor is warning evacuated residents not to hurry home. If you have been evacuated from #Sandy, return home only when officials say it is safe. [Update 8:59 a.m. ET] A scene from a shelter in Piscataway Township, New Jersey. Sgt. 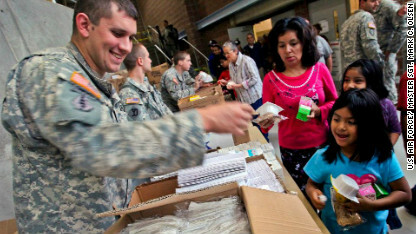 Michael Ryno and soldiers from the 50th Infantry Brigade Combat Team help displaced residents. [Update 8:52 a.m. ET] Superstorm Sandy has been creating waves up to 20 feet on Lake Ontario, something CNN affiliate WGRZ calls "unprecedented in living memory." See the WGRZ report here. [Update 8:36 a.m. ET] Superstorm Sandy is dumping a lot of snow. Just a few of the measurements so far: Webster County, West Virginia, 17 inches; Fayette County, West Virginia, 15 inches; Bowden, West Virginia, 14 inches; Canvas, West Virgina, 12 inches; Summersville, West Virginia, 10 inches; Mount Davis, Pennsylvania, 9 inches. [Update 8:13 a.m. ET] At least 168 people were stranded in about 59 locations in the New York boroughs of Manhattan, Staten Island, Queens and Brooklyn on Tuesday, a U.S. Coast Guard commander told CNN. [Update 8:12 a.m. ET] Drivers are being allowed back onto Connecticut roads. [Update 8:10 a.m. ET] Rescuers brought hundreds of people to safety, including some trapped on the roofs of trailer homes, and needed to reach hundreds more Tuesday in New Jersey communities near New York City that flooded when a tidal surge overwhelmed a natural berm, Gov. Chris Christie told CNN. [Update 8:04 a.m. 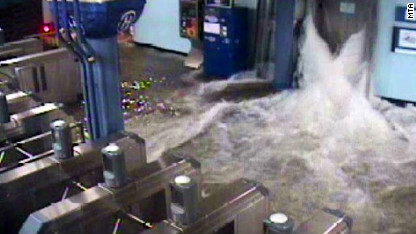 ET] Superstorm Sandy flooded some New York City subways. [Update 7:41 a.m. ET] More than 7 million customers in the Northeast are now without power due to Superstorm Sandy. [Update 7:35 a.m. 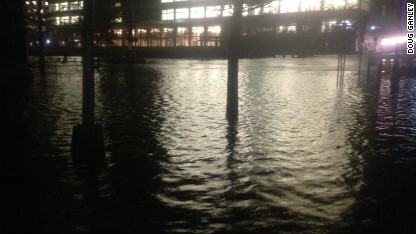 ET] CNN captured this photo from South Street Seaport, Manhattan, in New York City, as Sandy dumped heavy rain. [Update 7:29 a.m. ET] It will be days before power is fully restored in Newark, New Jersey, Mayor Cory Booker said Tuesday. The storm damage is tremendous, he said, and the majority of the city is without electricity. [Update 7:08 a.m. ET] The death toll from Superstorm Sandy has risen to 16 in the United States. 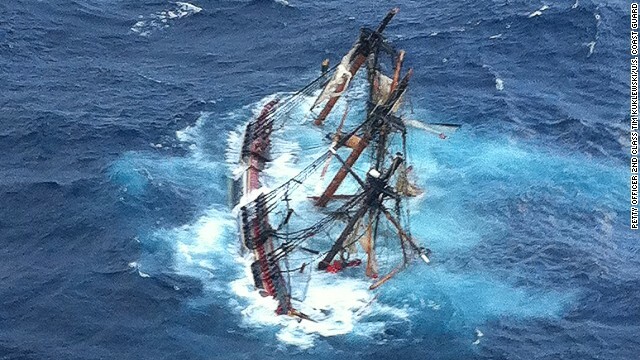 The deaths include five in New York, two in Maryland, two in Connecticut, three in New Jersey, two in Pennsylvania, one in West Virginia, and one from the HMS Bounty replica. There’s also been a death in Canada. Earlier, 67 people were killed in the Caribbean, including 51 in Haiti. That brings the overall death toll from Sandy to 84. [Update 7:04 a.m. ET] The West Virginia Department of Emergency Management says 11 counties are under blizzard warning until 6 p.m. today. About 121,000 customers are without power in the state. CNN's Martin Savidge reports about 8 inches of heavy, wet snow in Preston County, east of Morgantown. Interstate 68 is closed from Morgantown to the Maryland border. [Update 6:52 a.m. ET] Delaware Gov. Jack Markell said his state appeared "to have escaped some of the worst consequences" of Superstorm Sandy. Nevertheless, he said Tuesday, it has been a significant storm, with power outages and serious flooding. [Update 6:50 a.m. ET] Philadelphia's mayor said his city has coped well with Superstorm Sandy. "We got through it," Michael Nutter told CNN on Tuesday. He said emergency plans worked well, and he reported downed trees, other damage and flooding in the city along the Delaware River. Schools will be closed and mass transit will not be in operation Tuesday, Nutter said. [Update 6:37 a.m. ET] Almost 250,000 electricity customers in Northeast Ohio are without power this morning, CNN affiliate WEWS in Cleveland reports. [Update 6:31 a.m. ET] A leak at a water plant in Maryland is sending about 2 million gallons of raw sewage rushing out every hour. It’s the result of an overflow caused by power loss, according to the Howard County Emergency Management Department. Officials are working to restore power to the Little Patuxent Water Reclamation Plant. There are no mandatory evacuations as a result of the leak. Residents are asked to avoid the Little Patuxent River south of Route 32. [Update 6:16 a.m. ET] Ralph Verdi, chief of police in Little Ferry, New Jersey, says four to six feet of water is covering 75% of the town. “It’s been an extremely difficult night … We’re doing the best we can. “Our town’s in real trouble right now,” he told CNN's "Starting Point" with Soledad O'Brien. [Update 6:13 a.m. ET] The break of either a dam or levee in Bergen County, New Jersey, has authorities scrambling to rescue hundreds, and possibly as many as 1,000 people, Police Chief of Staff Jeanne Baratta says. The affected towns are Moonachie, Little Ferry and Carlstadt. “Something happened, because within 30 minutes those towns were under 4 or 5 feet of water,” Baratta told CNN. Authorities are using large vehicles and boats to rescue people, she said. [Update 5:53 a.m. ET] Authorities in Bergen County, New Jersey, are evacuating residents after a breach in a dam or levee flooded several communities. Police Chief of Staff Jeanne Baratta says there is up to 5 feet of water in the streets of Moonachie and Little Ferry. The state Office of Emergency Management says rescues also are underway in Carlstadt. - 67 in the Caribbean, including 51 in Haiti. [Update 5:47 a.m. ET] President Obama today declared a major disaster in New York state and ordered federal aid be made available to individuals in the counties of Bronx, Kings, Nassau, New York, Richmond, Suffolk and Queens. [Update 5:41 a.m. ET] A spokesman for Con Edison says Sandy has caused the worst damage in the utility's history. [Update 5:37 a.m. ET] Service on New York's subway system may not be restored Tuesday, MTA spokesman Aaron Donavan said. All of the under-river subway tunnels between Manhattan and Brooklyn took on seawater and so did a seventh tunnel between Manhattan and Queens. Earlier, the agency said it would take between 14 hours and four days to get the water out of the subway tunnels in New York City. [Update 5:30 a.m. ET] Two deaths have been reported in Maryland, bringing the U.S. total from Sandy to 15. The overall total is 83. [Update 5:19 a.m. ET] More than 50 homes have burned to the ground in the six-alarm fire in the Breezy Point neighborhood of Queens, New York, the fire department said in its official Twitter feed early Tuesday. [Update 5:17 a.m. ET] Authorities are conducting rescues from homes in three New Jersey towns after a dam break. The break occurred after midnight in the town of Moonachie in Bergen County, says New Jersey Office of Emergency Management Sgt. Adam Grossman. Rescues are underway in Moonachie, Little Ferry, and Carlstadt. Bergen County Police Chief of Staff Jeanne Baratta says thousands of people may need to be rescued. [Update 5:15 a.m. ET] Sandy's wrath is extending into Canada. More than 130,000 people are without power in Ontario and another 34,000 in Quebec, CNN affiliate CTV reports. [Update 5:09 a.m. ET] Superstorm Sandy weakened overnight as the massive system moved inland, the National Weather Service said in its 5 a.m. ET advisory. Winds dropped to 65 mph, but was still packing the punch of a tropical storm. The system is centered about 90 miles west of Philadelphia. [Update 5:08 a.m. ET] By early Tuesday, nearly 6.5 million customers were without power across 13 states and the District of Columbia, according to the latest CNN estimate. [Update 5:04 a.m. ET] More than 50 homes are now burning in a six-alarm fire in the Breezy Point neighborhood of Queens, New York, according to a fire department spokesman. Nearly 200 firefighters are on scene fighting the blaze. Fire officials confirm two minor injuries to civilians at the scene. [Update 4:38 a.m. ET] Wind and water have caused some damage to the Rock and Roll Hall of Fame on Lake Erie in Cleveland, CNN affiliate WEWS reports. [Update 4:33 a.m. ET] Airlines around the world canceled flights to and from the northeast United States as a massive storm slammed into the coast of southern New Jersey late Monday. Read the latest updates here. [Update 4:18 a.m. ET] At least two dozen homes are burning in a six-alarm fire in the Breezy Point neighborhood of Queens, New York, according to a New York Fire Department spokesman. Nearly 200 firefighters are on the scene fighting the blaze. [Update 3:47 a.m. ET] A New York fire department spokesman says at least two dozen homes are burning in a six-alarm fire in the Breezy Point neighborhood of Queens. [Update 3:45 a.m.] The U.S. Nuclear Regulatory Commission is keeping an eye on the Oyster Creek nuclear power plant in New Jersey where an alert has been issued. Water levels there exceeded the plant's criteria for high water, according to the NRC. The plant is in a regularly scheduled outage. Flooding on the West Side Highway in New York from superstorm Sandy. Outside the U.S.: 1 in Canada. And earlier: 67 in the Caribbean, including 51 in Haiti. [Update 2:44 a.m. ET] We've covered the Coast Guard's attempt to rescue the crew of HMS Bounty, a ship was built for the 1962 film version of "Mutiny on the Bounty," and which appeared in the 2006 blockbuster "Pirates of the Caribbean: Dead Man's Chest." Fourteen were rescued but one crew member died. The captain is still missing. 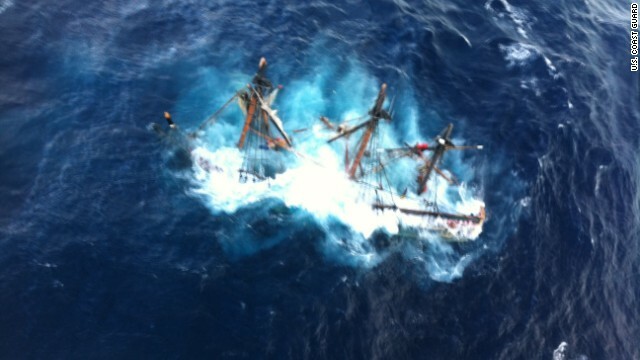 On Monday night, the Coast Guard released these pictures of the sinking ship. [Update 2:36 a.m. ET] What's next for Sandy? CNN Meteorologist Ivan Cabrera says the entire northeast corridor of the United States will bear the brunt of Sandy. High winds will blow from northern Georgia into Canada and as far west as Lake Michigan. Heavy rains will soak New England and parts of the Midwest, while snow will blanket the mountains of Virginia, West Virginia, Maryland, North Carolina and Tennessee. [Update 2:30 a.m.] Con Edison spokeswoman D. Joy Faber calls Superstorm Sandy “the storm of the century for us.” The company will evaluate the power grid before getting customers back online. “We’re making every effort to restore power as soon as possible,” she says. [Updated 2:19 a.m.] It will take 14 hours to four days to get out the water that has flooded the subway tunnels in New York, Metro Transit Authority spokesman Kevin Ortiz said. The New York City subway system is 108 years old, but it has never faced a disaster as devastating as what we experienced last night. Hurricane Sandy wreaked havoc on our entire transportation system, in every borough and county of the region. we had to evacuate so don't know how the story for the carousel ended. the lights were still on when we were leaving. It broke my heart. [Update 2:02 a.m.] 6,535,896: That's the number of customers without power across 13 states and Washington D.C.
[Update 1:57 a.m.] The 2 a.m. advisory is out: Superstorm Sandy continues to pack hurricane force winds more than five hours after making landfall along the coast of southern New Jersey, according to the 2 a.m. ET advisory from the National Weather Service. The system is centered about 10 miles southwest of Philadelphia. [Update 1:38 a.m.] The U.S. death toll from Sandy now stands at 13 after police in Pennsylvania said an 8-year-old boy died Monday after he was struck by a tree limb in Susquehanna County, Pennsylvania. [Update 1:32 a.m.] New power outage numbers: 5.5 million customers in 13 states and Washington D.C., according to a CNN tally. [Update 1:27 a.m.] Now come the blizzards. The National Weather Service says a blizzard spawned by Sandy will bring 2 to 3 feet of snow to the mountains of West Virginia, with 1 to 2 feet expected to fall in Southwestern Virginia. Another 12 to 18 inches of snow will fall in the mountains near the Tennessee-North Carolina border. [Update 1:22 a.m.] Reporter Jeff Pegues with CNN affiliate WABC says the howling winds and rising waters of Sandy shorted out power lines and sparked a major fire in the Rockaway Park area of Queens Monday evening, according to firefighters. [Update 1:15 a.m.] NYU Langone Medical Center says backup power to the facility has failed. The hospital is evacuating all patients now. Earlier, it had said it was evacuating nearly all. [Update 1:03 a.m.] The rain will continue and "the winds are still going to be howling” overnight, says CNN meteorologist Ivan Cabrera. “We’re tracking a hurricane and a blizzard all at the same time.” The blizzard in the mountains of Virginia and West Virginia will last 36 hours. [Update 1:03 a.m.] Trillian Media captured this explosion at a Con Edison power plant Monday evening, that plunged many New Yorkers in the dark. The explosion happens around 18 seconds - and you can see parts of the city slowly go dark. [Update 12:51 a.m.] More than 99 blood drives in the Northeast have been canceled due to Sandy. This is likely to create a blood shortage in the Northeast as emergency crews work to help those injured. To help with the anticipated shortage, the Red Cross is encouraging people throughout the country to donate blood. People can also donate $10 to disaster relief efforts by texting REDCROSS to 90999, or they can contribute online at www.redcross.org. “We are expecting to been a very long and difficult situation,” said spokeswoman Kristiana Almeida. [Update 12:45 a.m.] York University's Langone Medical Center isn't the only one medical facility impacted by the storm. New York’s Bellevue Hospital Center has had flooding in its basement and is currently using emergency backup power, but no injuries have been reported. Ian Michaels of the Office of Emergency Management says the main priority is to help secure additional power, and obtain additional fuel and pumps for the hospital. [Update 12:37 a.m.] At least 5.3 million people are without electricity across 10 states and Washington D.C., according to a CNN tally. Standby for updated figures as info continues to roll in from other affected states. [Update 12:35 a.m.] There's been a 12th death in the United States: A 62-year-old man was killed in by a falling tree in Oley, Pennsylvania. "The gentleman went outside to let his dog out. And he was on his back porch when a tree fell on the porch," said Pennsylvania State Police spokesman David Beohm. [Update 12:12 a.m.] The storm surge along with the high tide that resulted in historic water levels in western Long Island Sound has started to recede, the National Weather Service said on Monday night. Water levels will continue to fall below flood stage through the overnight hours, the weather service said. [Update 11:50 p.m.] Sen. Bob Menendez, North Bergen, NJ, was on air a few minutes ago and said the building he lives in had its windows blasted out. "I think it's the worst we have seen here in my lifetime,” he said of the damage in his state. [Update 11:45 p.m.] Sandy has claimed its first casualty in Canada. A woman was killed when she was struck by flying debris in Toronto, the city police said on its Twitter feed Monday night. The city is also experiencing wind gusts , wet roads and heavy rain. About 6,000 customers are without power, police said. [Updated at 11:42 p.m.] Brooklyn borough President Marty Markowitz tells CNN that New York firefighters were having difficulty getting to a fire at Coney Island Hospital late Monday because of the flooding. [Update at 11:37 p.m.] A caravan of ambulances is ferrying patients of New York York University's Langone Medical Center after it lost power, CNN affiliate WABC showed. [Updated at 11:35 p.m.] Sandy continues to pack 75 mph winds as it moved over land late Monday, according to the National Hurricane Center's 11 p.m. advisory. The center of the storm, which is moving northwest at 18 mph, is 10 miles southwest of Philadelphia. The Miami-based weather agency warns that hurricane-force gusts, in excess of 74 mph, could be felt overnight from Chincoteague, Virginia, to the Cape Cod community of Chatham, Massachusetts. [Updated at 11:31 p.m.] A buoy located at the entrance to New York Harbor rose to a record height of 32.5 feet on Monday night, according to the National Weather Service. This breaks the previous record of 26 feet, set during Hurricane Irene in August 2011. [Posted at 11:29 p.m.] More than 670,000 New Yorkers are without power, Con Edison official John Miksad said late Monday. Donald Trump is strangely not in the news.? He has $5 million dollars to wave in the air but no charity to give it to. Please help the Donald do the right thing. Your video request on IReport for Mr.Trump's gracious donation will be a step forward in neighbohood relations. Historic? Please, are people so in the dark they don't remember what has happened in the past. If they would have paid attention to the past they would be just fine. Next time prepare! Superstorm? Sandy? What an imposing name. Give us all a break. The only thing "super" about this storm was the stupidity, lack of preparation and arrogance of the people affected. I've a WordPress blog with Arras theme. This site strangely shows different on different computers. On some computers, I see all 3 columsn, on other PC, I see only 1. On other PCs, some wiered things. Please somebody help me..